http://www.line-stickers.com/ – Fuchico Supports Working Women Stickers Line Sticker | This set is a must for all the hard working women out there! 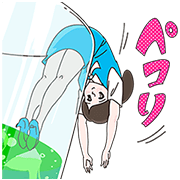 Unforgettable Fuchico of “Fuchico on the Cup” fame has teamed up with stiff shoulder relief product “Harikkusu Hogrela” for a power duo of great stickers! Let Fuchico cheer you on while you’re on the job! Available till October 6, 2015.